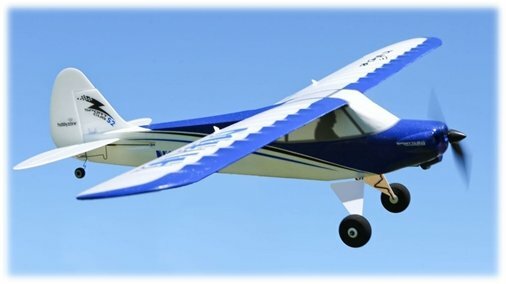 Electric foam rc airplanes, or 'foamies', have become very popular in recent years, especially so with beginners to the radio control flying hobby. They represent great value for money and it's easy to see why they're such big sellers. Foam rc planes come in all different shapes and sizes, and manufacturers have really upped their game by producing some excellent scale planes (notably warbirds). Scale detailing such as rivets and panel lines can easily be designed in to the moulding process, and so a finished foamie can look almost as good as a scratch-built balsa plane that the builder has poured hundreds of hours in to! There are many manufacturers producing foam rc airplanes these days, such is their popularity, with names such as ParkZone, HobbyZone, E-flite, Art-Tech, Dynam, Multiplex and FMS (to name the big players) all leading the way. ParkZone foam rc airplanes are probably some of the most popular and best value ones out there for new modellers, although only a few of their planes are truly suitable for beginners. ParkZone comes from US giant Horizon Hobby who also have HobbyZone, E-flite and Hanger 9 brands under their belt, to name just a few. The HobbyZone brand caters more for the beginner, with the HobbyZone Sport Cub S RTF now a popular choice for beginners, having replaced the massively popular HobbyZone Super Cub. The FMS/Airfield brand has also become synonymous with good quality foam warbirds, they were the first company to enter the larger wingspan (around 1400mm) field. The scale detailing on their planes really is excellent, and many of these larger planes feature flaps and retracts as standard. 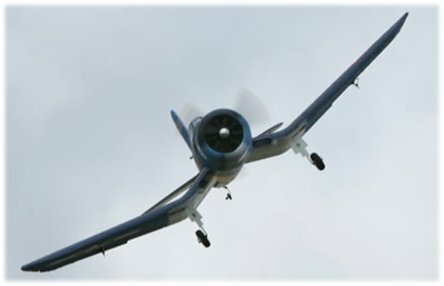 Such warbirds really do look great, and the addition of a realistic rc sound system can finish these planes off very nicely! Foam rc airplanes are, generally speaking, very durable. Different types of foam can be used in the manufacture of planes, with different foam suiting different applications. The main foams used are Expanded Polystyrene (EPS), Expanded Polypropylene (EPP), Expanded Polyolefin (EPO) and Depron. The most common one for the RTF market is EPO and this is often given a 'trade name' by each manufacturer. For example, Multiplex call it ELAPOR while Horizon Hobby call it Z-Foam. Depron is commonly used in, but not limited to, the construction of indoor rc planes, particularly the shock flyer type, or 'shockie'. Depron is relatively strong, but it does need to be used in conjunction with carbon spars (or balsa) to optimise the strength. Foam rc planes are, generally speaking, easily repaired but you have to be very careful about which glue you use. Different foam types react differently to different substances, and it's imperative that you test on a scrap piece first. 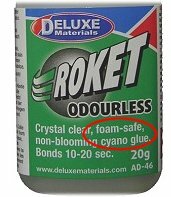 Many glues commonly used in rc airplane building and repairs will dissolve some types of foam, and CA (cyanoacrylate or 'super glue') glues are some of the worst offenders. If you intend using any glue on your foam plane make sure that it's 'foam friendly' or 'foam safe' glue, it usually states this on the label. A personal favourite of mine for making any EPO repairs is Gorilla Glue. This expands as it cures and interlocks the foam beads as it does so, resulting in a very strong bond. If you choose to use CA with a kicker, be very careful that you don't apply too much of either. A viscous reaction between the two substances can create enough heat to melt the foam that it's been applied to! A trick worth knowing, when it comes to repairing a foam plane, is to use hot water to restore any areas of crushed or dented foam. The heat expands the foam and any crushed/dented area returns to its former shape. It doesn't always work, depending on the severity of the damage, but it's always worth a shot. The majority of RTF (learn more about Ready To Fly planes) rc airplanes these days are foam, but a downside to flying foamies is that they more adversely effected by the wind. This is because they weigh less than an equivalent sized balsa/ply airplane. So on windy days a foam plane is going to get knocked around the sky more than a balsa one, making the pilot's life at the transmitter sticks a little harder, this being much worse if you're just learning to fly. But with that said, standalone gyros or receivers with built-in gyros are becoming commonplace. This means that you can set up pitch and roll stabilisation to act against unwanted twitchiness caused by wind gusts. So with such a system in place, a foam plane can be made to fly a lot more solidly than it otherwise would. So foam rc airplanes (and gliders) of all types are certainly here to stay and the range available is huge; it's probably fair to say that there are more foam planes on the market now than balsa/ply ones, but that's not to say that traditional kits are disappearing; they're not and if anything are making a comeback. One possible reason for this is that foam planes have brought countless new people to the hobby of radio control flying, and these once-beginners now want to build their own planes and move across to balsa/ply construction. But for instant, convenient flying at a lower cost you can't beat an electric foam rc plane! As already mentioned, foam planes are widely available these days and there's certainly no shortage of places selling them. If you have a local hobby shop, please try and support that as best you can. Otherwise, Amazon is a great place to buy RC products from now, with all the big sellers having a presence there.